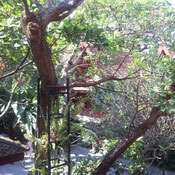 Jim Thompson was an American who settled in Thailand after the end of the Second World War. 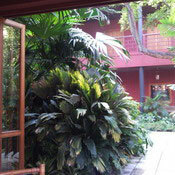 He devoted himself to revitalizing a cottage industry of hand-woven silk, which was dying out. 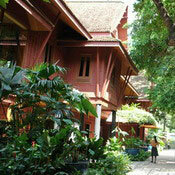 His house was built from parts of six antique Thai houses which had been dismantled and brought to Bangkok. 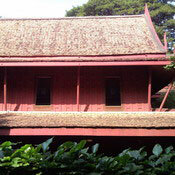 Jim Thompson located a group of Muslim weavers in the Bangkok neighborhood of Bangkrua and provided hitherto unavailable color-fast dyes, standardized looms, and technical assistance to those interested in weaving on a piece-work basis. 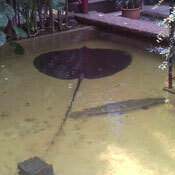 His endeavour showed a profit from its first year of operation. Thompson's determination to keep his company cottage-based was significant for the women who made up the bulk of his work force. In 1958 he began what was to be the pinnacle of his architectural achievement, a new home to showcase his art collection. 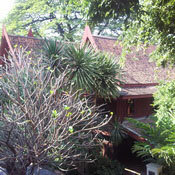 Formed from parts of six antique Thai houses, his home sits on a canal across from Bangkrua, where his weavers were then located. 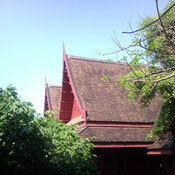 Most of the 19th century houses were dismantled and moved from Ayutthaya, but the largest - a weaver's house, now the living room - came from Bangkrua. 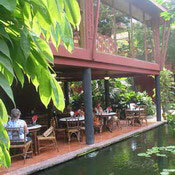 During Easter 1967, Jim Thompson disappeared while on holiday in the Cameron Highlands of Malaysia. An extensive and extended search failed to reveal any clues about his disappearance.